We have positioned ourselves in the league of the most trading and supplying of Transmission Line Equipment. Our range of product comprises AB Switches, AB Cable Accessories, Cable Jointing Kit Products, Earthing, Insulator & Accessories, Switchgears and Transmission Line Material. We obtain these products from the certified market vendors with the aid of our procurement agents. These products are known for their longer functional life, easy installation, low maintenance, superlative corrosion resistance and hassle-free operations. We are prominent manufacturer and supplier of our products. 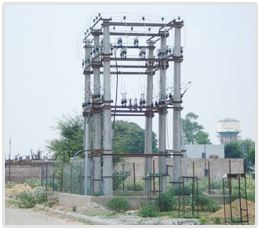 Double Pole structure with I beams welded MS plate at the bottom and fabricated with strips to hold insulators for earthing strip, Channels to install material as required, Clamps and nut bolts for assembly of equipment. All material duly painted and if required Hot dipped galvanized also available. Our product quality is duly tested by our team of quality controllers to make the range free from all defects.